Seeking shade from the fierce summer sun, a group of harvesters recline under the boughs of a tree sharing a simple meal of bread and cheese. The whole scene bustles with activity as a number of labourers still toil in the field beyond, gathering the carefully scythed corn into neat stooks. Men, women and children all lend a hand giving a sense of dynamic community to the work. A little child dressed in a white smock can be seen wrestling with a bundle of corn far too big for her to manage. Another young child sits in the shade, his back to the viewer as he thirstily drinks from the bowl of milk that has been set upon a spotless, white table cloth. In bare feet a man and a woman frame the activity of the harvesters’ merry picnic; the woman bending forward to eat while the man leans back to drain a flagon of ale. With their hats and scythes cast aside for the brief respite provided by their meal, this group stands in contrast to the hard work still going on behind them. A little dog mischievously sniffs the picnic basket next to his unsuspecting owners, who are oblivious to everything except resting their weary limbs and sating their hunger. This imbues the ritual of the harvest with a sense of light hearted realism. In the composition of An Allegory of Summer, Abel Grimmer creates an almost pictorial narrative aided by a subtle yet highly effective use of light and shade. In the left foreground, a shepherd dressed in a loose red tunic and virtually obscured by the shade of a tall oak idly tends his flock as they amble unhurriedly down the brilliantly sun-lit path. Three sheep pause at the bottom leading the eye at once to the relaxed picnic of the tired labourers. The stooks and the precise line resulting from the harvesters’ toil lead the eye further back into the recesses of the composition, to the horse-drawn cart and a cluster of paler silhouettes of the same foreground stooks. Two farmsteads stand at the edge of the field, while beyond, blue-green woods line the horizon. In the very far distance a shimmering church spire can be seen, the creamy clouds tinged with pink vividly conjuring up the reality of the searing heat and windlessness of a perfect summer’s day. Grimmer is known principally for his numerous small-scale paintings of country scenes, sometimes with biblical themes. Often his works form part of a series of the four seasons or the months of the year and no doubt this present work followed the same format. A complete series of the four seasons is held in the Koninklijk Museum, Antwerp. As Reine Berthier de Sauvigny has suggested, Grimmer’s An Allegory of Summer can perhaps be linked to The Month of May¹ which is of approximately the same dimensions and stylistically highly similar.² It is also possible that this panel was painted as a single month and incorporated into a series of the full twelve months of the year. While the majority of these series are now dispersed, Berthier de Sauvigny identifies one complete set of twelve that was last recorded in Belgium. The origins of the Flemish tradition of landscape painting on panel, as exemplified by Grimmer’s An Allegory of Summer, can be traced back to the miniature paintings of medieval manuscript illumination. 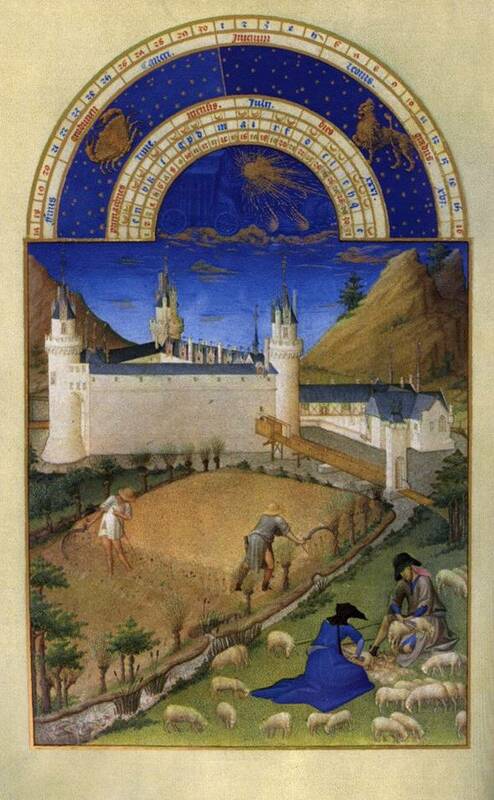 The celebrated Très Riches Heures de Duc de Berry (c.1411-1416, Musée Condé, Chantilly, France) illustrated by the Limbourg brothers, provides a supreme example of such craftsmanship. It depicts the labours of the months within detailed, naturalistic landscapes for the first time in the history of art. The same type of calendar decoration was taken up once more in Netherlandish art with the Da Costa Book of Hours (c.1515, Pierpont Morgan Library, New York) by the native Bruges artist, Simon Bening (1483/4-1561).¹ The importance of the innovations heralded by manuscript illumination in the northern Netherlands was not lost on Grimmer given that, in a fashion similar to the Limbourg brothers’ illustration of July, he too includes landscape, architecture and a highly accurate iconography of the seasons. In An Allegory of Summer with Three Signs of the Zodiac (Private Collection), the season is made recognisable by the weather and the activities of the figures depicted. The signs of the zodiac in the sky also identify the time of year. Signs of the zodiac are rare in Grimmer’s work and do not feature in An Allegory of Summer. Their inclusion in An Allegory of Summer with Three Signs of the Zodiac, however, demonstrates his clear knowledge of the traditions and techniques of manuscript illumination. An equally, if not more, important influence upon Grimmer’s works came from his predecessor and compatriot, Pieter Brueghel the Elder (c.1525-c.1569). The Harvesters is one of six panels by Brueghel the Elder designed for the home of the wealthy Antwerp merchant Niclaes Jongelinck. The series, which represented the seasons or times of the year, included six works, five of which survive.⁴ Brueghel’s unique sensitivity to rendering nature in all her glory marked a clear departure from his predecessors since he favoured suppressing the religious associations of earlier depictions of the seasons in favour of an unidealised vision of landscape. Brueghel’s The Harvesters probably represented the months of August and September in the context of the series. It shows a partially cut and stacked field of corn, while in the foreground a number of peasants pause to picnic in the relative shade of a pear tree. Work continues around them as a couple gathers wheat into bundles, three men cut stalks with scythes, and several women make their way through the wheat field with stacks of grain over their shoulders. The vast panorama across the rest of the composition reveals that Brueghel’s emphasis is not on the labours that mark the time of the year, but on the atmosphere and transformation of the landscape itself. Grimmer’s An Allegory of Summer has much in common with Brueghel’s exquisitely naturalistic setting of the same subject matter. In both, tired peasants can be seen resting from the summer heat under the shade of a tree while others continue toiling in the field behind. The strikingly similar poses of the exhausted labourers, their legs splayed out in weary abandon is of particular note in both works. The linearity of Brueghel’s cornfield is also a point of comparison. In terms of its rigid line and methodical composition, Grimmer borrows aspects of Brueghel’s style. In a number of other ways, however, Grimmer’s An Allegory of Summer is highly individual. The graphic, detailed treatment of the features in the foreground of the work, such as the twisted tree trunk, dark foliage, sheep and undulating path, are distinctively his own. There is a typically schematised quality to Grimmer’s treatment of colour and composition in the painting with bands of brighter areas juxtaposed with darker ones. The bright sunlit path of the foreground is set against dark foliage just as the shimmering golden cornfield is bordered by the deep blue-green woods on the horizon. Scarcely perceptible flecks of white on the foliage of the distant trees lend them a silvery quality which contrasts with the warm green, brown and ochre tones of the foreground foliage. The artist’s progressive use of cooler, blue-green hues as the scene recedes into the distance derives from the tradition of atmospheric perspective prevalent in Flemish landscape painting, which was introduced by Joachim Patenir (c.1475/1480-1524). Not only does this technique serve to lend the work a greater depth, it also keenly evokes a palpable atmosphere of a tranquil summer’s day. Grimmer was the son of his painter father, Jacob (1525/6-before 1590) whom the art historian Giorgio Vasari (1511-1574) considered one of the finest landscapists of his time and of whom van Mander made the claim that he knew of no other artist who was so ‘outstandingly skilled in landscapes’.⁵ Jacob Grimmer was one of the first Netherlandish artists to break with the tradition of the mountain landscape pioneered by Patenir. Instead he depicted broad landscapes of the Flemish countryside, as exemplified in his Four Seasons of 1575 (Museum of Fine Arts, Budapest) which were executed ten years after Brueghel’s six panels of the months. Although Grimmer’s An Allegory of Summer is akin to his father’s Four Seasons both in its naturalism and close observation of nature, it is also individual in style and distinct from Jacob Grimmer’s panels. Born in 1570, Grimmer became a master in the Antwerp Guild of St. Luke in 1592. His paintings owe much to his father’s style as well as to Brueghel the Elder, as discussed above. Grimmer often copied prints engraved by Pieter van der Heyden (c.1530-1572) after designs by Brueghel and the artist Hans Bol (1534-1593).⁶ His series of the Twelve Months (1592, Montfaucon-en-Velay, Haute-Loire, Chapelle Nôtre-Dame), for instance, are exact copies of Adriaen Collaert’s prints after Bol.⁷ While he also painted church interiors and other architecturally inspired pieces, Grimmer is perhaps best known for his depictions of peasants at work or leisure in the outdoors as in An Allegory of Summer. ¹ With Galerie R. Finck, Brussels. ² See literature: R. Berhier de Sauvigny, p. 264, no. 9, fig. 136. ³ A. van Suchtelen, Holland Frozen in Time, The Dutch Winter Landscape in the Golden Age, Exhib. Cat., The Mauritshuis, The Hague, 24 November 2001-25 February 2002, Waanders, p. 37. ⁴ The other four are: Gloomy Day, Return of the Herd, Hunters in the Snow (all Vienna, Kunsthistorisches Museum), and Haymaking (Nelahozeves, Czech Republic, Roudnice Lobkowicz Collection). ⁶ The series of engravings by P. Van der Heyden after Pieter Breughel the Elder and Hans Bol are at the Rijksmuseum, Amsterdam. Reproduced in A. van Suchtelen, Holland Frozen in Time, The Dutch Winter Landscape in the Golden Age, pp. 42-44. ⁷ Hollstein: Dutch and Flemish, iv. no's. 523-34 (published by Hans van Luyck, fl. c.1580-85, in 1585). Literature: R. de Bertier de Sauvigny, Jacob et Abel Grimmer, Belgium 1991, p. 268, no. 28, reproduced in colour plate 95.